Join us for the Mugs for Moms brunch event at Cone 10 Studios in Charleston sponsored by Skirt Magazine. Guests of Cone 10 are invited to a brunch at the studio. Coffee and beverages will be served in ceramic mugs created and donated by potters and other makers in the Charleston Clay & Art community. All of the proceeds will benefit Postpartum Support Charleston to help moms and their families in our community. Tickets: $40 per person includes a hand-made mug by a local artist, brunch and music provided by the V-Tones of Charleston. Mugs for Moms was founded by potter, Maria White. White is the mother of two and a survivor of postpartum anxiety and depression. 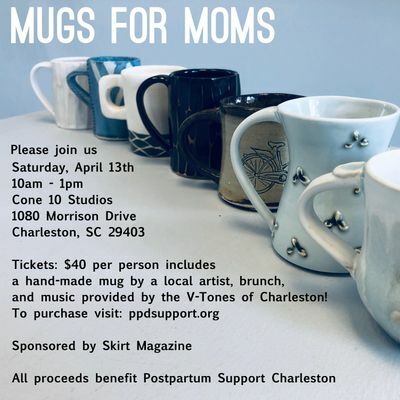 She is hopeful that Mugs for Moms will help raise awareness about maternal mental health and benefit the crucial work of Postpartum Support Charleston. Postpartum Support Charleston is a local nonprofit serving the Charleston Tri-couny area. Money raised from this event goes directly back to the community providing support and resources for moms struggling with postpartum depression and anxiety. The organization offers free support through their Moving Into Motherhood online support community, in person support groups as well as access to Mom Mentors who are trained as peer supporters to moms in the community. In 2019, it is estimated that as many as 2,000 moms will suffer from postpartum depression and anxiety in the Charleston Tri County area. With support from this event, the organization hopes to reach over 200 moms this year and have 12 trained Mom Mentors.